Vascular dementia occurs when the area of the brain responsible for cognitive ability suffers from a lack of proper blood circulation. Atherosclerosis, brain injuries or strokes can all cause this problem. Although the disease process has the potential to progress like Alzheimer’s, VaD is treatable under certain conditions. Following are little-known facts about VaD that Clearwater dementia caregivers should understand. 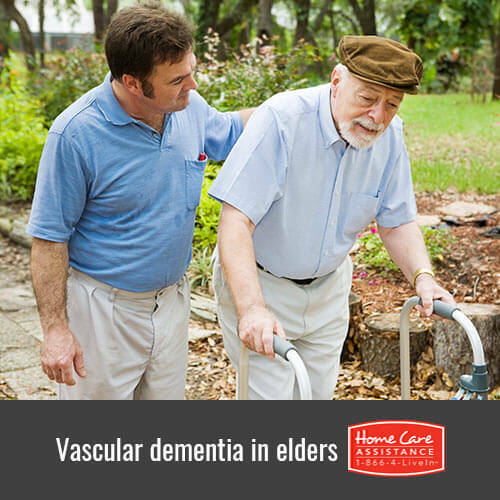 Studies indicate that up to 20 percent of elderly adults who are diagnosed with a cognitive disorder are living with some degree of VaD. This makes VaD the second most common type of dementia after Alzheimer’s disease. The majority of adults first complain about memory loss. Similar to the trauma caused by a stroke, VaD victims might experience a wide range of cognitive malfunction, sensory deprivation and physical disability. Emotional and personality changes such as depression and anxiety are also common symptoms. Physicians initially rule out the presence of an infectious disease, diabetes, electrolyte imbalances, thyroid malfunction or similar conditions that can affect cognitive function. If none of these disorders exist, MRI imaging studies that highlight vascular blood flow indicate the source of the problem. Any hope for treatment depends on the reason for the circulation blockage. Blood clots can be removed through medication or invasive means. Certain medications reduce the inflammation and swelling that develops after a brain injury. However, in the case of cerebral injury, natural healing must take place. Additionally, cognitive therapy might help restore speech and physical function. Seniors must take prescribed medications that prevent blood clot formation, treat diabetes or manage thyroid problems. Some require antihypertensive formulations. Proper diet and exercise offer much in the way of ensuring cardiovascular health and continuous blood circulation. Although Alzheimer’s and vascular dementia are two different disease processes, elderly adults can have both disorders simultaneously. If you suspect this is the case for your loved one, visit his or her doctor immediately for evaluation. Along with being compassionate and patient, there are a number of ways live-in Tampa Bay caregivers can help seniors living with cognitive difficulties secondary to VaD. Music, photographs and conversation often trigger memories. Find activities designed to strengthen specific cognitive functions. If you currently look after a senior with dementia, turn to Home Care Assistance in Tampa Bay for help. We provide comprehensive memory care services for seniors with cognitive disorders like Alzheimer’s and dementia. Contact us at (727) 330-7862 today to learn how our memory care boosts physical, emotional and mental wellbeing in the comfort of your loved one’s home. What Exactly is Memory Care?